A Stefanie Schneider exhibition introducing works by Daisy McCrackin, Camille Waldorf & Max Sharam. 29 PALMS, CA is a feature film / art piece that explores and chronicles the dreams and fantasies of a group of individuals who live in a trailer community in the Californian desert. private history turned into an intimate mythology of elemental fantasies where reality is perceived through a veil of psychedelic memories and unconscious projections. such is a collection of passions and dreams, an uncanny diary of ephemeral narratives and mental intensities in Stefanie Schneider’s painterly photographs where subjectivity of an ontological doubt uses a poetics of pastische as a vehicle for an intertextual journey towards the truth and the authenticity of primary emotions. here time is immersed in a nostalgic suspense of oneiric dimension, a sort of ambiguous coma of silence and comfort, and open space embraces a psychotic landscape of solitude and accidental pleasure. fetishisized surface of extreme feelings gives a stage for an unsolicited promise of unconditional love and unlimited freedom, a promise framed by sensual tension between fulfillment and expectation. supported by "Medienboard Berlin Brandenburg" and "ARTE". Stefanie Schneiders Fotografien sind auf faszinierende Weise mysteriös. Ihre Motive erinnern an Szenen von David Lynch. Surreal entrückt und verstörend real im selben Moment. Die Fotografin arbeitet mit der Polaroid Kamera und verwendet dafür ausschließlich abgelaufenes Material. Ihre Blow Ups sind das Ergebnis unvorhersehbarer chemischer Prozesse, die die aufregende Dramatik und Ästhetik ihrer Bilder erzeugen. Farbverschiebungen, Flecken, Unschärfen und unerwartete Überstrahlungen legen sich wie eine zweite Realität über ihre „Polaroid Movies“. Cyndi Lauper ist neben Madonna, Cher, Lauryn Hill eine der wenigen Solosängerinnen, die es trotz ihrer Eigenheiten geschafft hat, jahrelang an der Spitze zu bleiben. Noch immer werden ihre alten Superhits „Time after Time“, „She bop“, „Girls just wanna have fun“ weltweit gespielt. Nach ihrer sehr erfolgreichen Tour 2007 zog sich Cyndi Lauper ins Studio zurück und arbeite zum ersten Mal mit europäischen House und Elektro Künstlern wie Digital Dog, Basement Jaxx, The Scumfrog, Dragonette und Telepopmusik zusammen, um etwas Neues zu versuchen. Im Frühsommer wird ihr neues Album erscheinen. Nachdem sie das von Stefanie Schneider fotografierte Plattencover einer Red Hot Chilli Peppers Single gesehen hatte, bat sie die Künstlerin, alles für ihre neue Platte und die Werbekampagne zu fotografieren. Zwei Popstars aus unterschiedlichen Branchen, Fotografie und Musik, zwei Frauen unterschiedlicher Generationen treffen aufeinander: Stefanie Schneider und Cyndi Lauper im Shooting. Metropolis ist exklusiv dabei. A project by Stefanie Schneider, camera Stefanie Schneider, music Daisy McCrackin, Sophie Huber, Zoê Bîcat, editing Stefanie Schneider, with Austen Tate (Margarita), Daisy McCrackin (Cristal), written by Austen Tate, Daisy McCrackin, Stefanie Schneider, sound editing: Sophie Huber, produced by MICA Film, Berlin, Caroline Haertel und Mirjana Momirovic, supported by "Medienboard Berlin Brandenburg" and "ARTE". 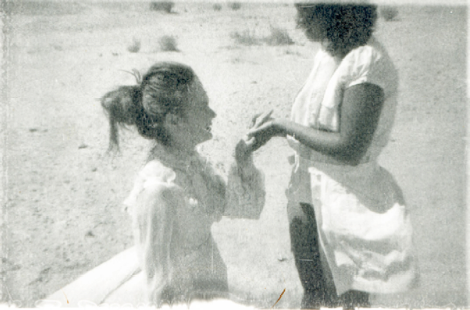 "Till death do us part", an episode of the "29 Palms, CA" project. A film shot on Polaroid stills combined with Super 8 film sequences. Till Death Do Us Part is the story of two young lovers, lonely souls escaping the abuse of reality into each other. Imagine a stranger suddenly in your path, you can just be silent with, and you feel you have known her forever. This is the experience of Cristal (Daisy McCrackin) and Margarita (Austen Tate), that begins when Cristal picks her up hitchhiking on a lonely dessert road. A runaway from a cruel older brother and a broken family, Margarita is searching on the edge of the shadows for a home. Cristal was also a lonely child and already dangerously close to vanishing when she finds Margarita. For her it is the begging of life. When she finds Margarita, she finds herself, she feels for the first time and discovers that she is not invisible after all. The childlike, roadside life they make together is a dream that they truly believe will last forever, and with the naive joy of beginners, they dive in, never sensing danger. When two lost souls become one and share everything, do they loose themselves further or do they become whole at last? When a girl has no home, no anchor, can she combine thrive with another? Once a human heart wakes up from isolation for the first time, enchanted by a reflection in love's mirror, can the dreamer fall asleep again, or must she wander searching to find it again forever? An artistic triumph for Schneider, this piece floats deeper into her exploration of the colors of the human psyche, separation, relationship, androgyny and the fringes of social reality. 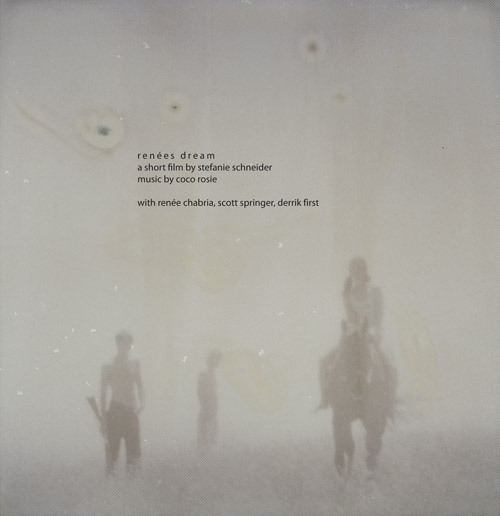 Austen Tate gives Margarita her voice in poetry and Daisy McCrackin gives Cristal her sound in music. THE SOUNTRACK BY DAISY McCRACKIN. Austen Tate gives Margarita her voice in poetry and Daisy McCracking gives Cristal her voice in music. For the first time in Germany we proudly present Daisy McCrackin life in concert. Daisy McCrackin creates Cristal, the gender confused, love hungry, desert born waif. She is a musician, singer-songwriter, actress and political activist. She is known to be a powerful muse. She also paints and more than one established painter has said of her, "No one can paint faces like Daisy". Daisy was born in San Francisco and survived the earthquake of 1989. Raised by a single, working mother in the shared company of her three brothers, she excelled at athletics and the arts early on. At 8 years old she earned a scholarship to study with The American Conservatory Theater, where she performed onstage in numerous productions. While Daisy attended the prestigious School of the Arts High School, she nabbed her GED at 16 and headed up to Northern California to live on an ashram and immerse herself in her spiritual studies. It was at the ashram that Daisy heard a friend sing a Leonard Cohen song, and was inspired to pick up the guitar and teach herself to play. It wasn't long before Daisy made her way to Los Angeles to pursue an acting career, all the while playing guitar, writing songs, and singing herself awake in the mornings, and back to sleep again at night, never imagining she would one day share her music with anyone, let alone the world. While she quickly achieved success as a fresh-faced young starlet, booking coveted roles in feature films, television and commercials, she soon sunk into the vacuous void of artistic starvation. Longing for creative freedom and a more expansive method of expression, Daisy ditched her acting career and took to the road. She spent a year abroad, writing her way through Europe, reconnecting with herself as an artist and a lyricist, and pondering what kind of career to pursue next. Back in Los Angeles, Daisy moved to the fabled Rodeo Grounds arts collective in Topanga Canyon, where she bathed in the deep and salty waters of authentic expression daily. Inspired by the eclectic community of artists living by the beach, serving as a muse and creating by the moment, Daisy took up painting, and continued to labor at the guitar. Immersed in a supportive environment that encouraged her artistic exploration, Daisy wrote songs and improvised instant ballads 'round the famed campfire, holding her fellow creatives captive while dazzling them with hilarious impromptu outpourings of quirky lyrics, sung to sweet, simple melodies. Still too shy to share her "serious" songs, Daisy stuck to modeling by day, and making her cohorts laugh by night. Finally, after an intense song-writing jag Daisy sang a somber, personal song to a close friend who advised her to quit her day job and dedicate herself full-time to music. She played her first live show in 2006, and was dubbed "an instant rock star" in an LA Weekly review, which reported that Daisy "stole the show." Daisy's melodies are unique, potent and penetrating. There is a sweetness in the simplicity of her songs, in the vulnerable sincerity of her delivery, and in the ever-so-perfectly placed moments of profound lyrical prowess that cut straight to the heart and the soul and the spirit. Daisy recorded thirteen live, acoustic songs for frequent collaborator, filmmaker Stefanie Schneider's feature film, "29 Palms." 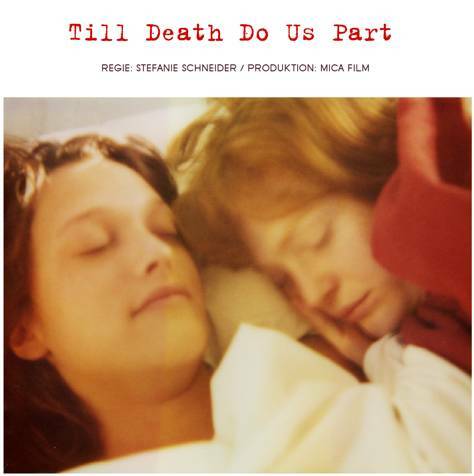 The soundtrack, "Till Death Do Us Part," marks Daisy's first musical release, and is available on CD and as a collector's piece in vinyl in Germany. Margarita has been developed, played and written by Austen Tate. Austen Tate is an actress, journalist, and Holistic Health Practitioner. An artist at heart and mystic in spirit some of her goals in life are to inspire artists, help people and the earth heal, transcend spiritual life, awaken universal knowledge, and bring all of creation into balance. Incorporating these daily reminders into her own life, through this vision, she directs herself to work on developing her theatrical attributes, poetry, paintings, script writing, yoga practice, and healing work. Austen draws upon her innate experiences in her work from growing up with family and community in the Los Angeles film industry, art world, news network, and ecoconscious societies. Her first commercial was at age 5 followed by modeling and then short films. Some of her acting mentors include Jaid Barrymore, Dennis Levalle, and Ralph Peduto. At an early age she left home to live in the mists of Topanga Canyon with the infamous Rodeo Grounds crew, an anarchist stomping ground, where she learned to open the gates to artistic expression. While living in Malibu, Austen took on journalism for The Malibu Times and Malibu Magazine writing news brief's and articles concerning art, fashion, film, and environmental issues. When the Rodeo Grounds was shut down by the State Park she ventured off to San Diego where she was introduced to live food chefing, natural health and Native American spirituality. By attending Native American ceremonies and seeing an holistic approach, she then went on to educate herself at Heartwood Institute. In the mountains of Northern California, Austen lived in a sustainable healing arts community practicing meditation, movement therapy, whole foods cooking, and bodywork. The German artist Stefanie Schneider (*1968) has made a name for herself as a photographer building on visual effects from her work with expired polaroid material. Not limiting herself to static images her domain is installations combining photography, video, sound and text. Straddled between Berlin and Los Angeles, Schneider enjoys an increasing international reputation, although she is virtually unknown to the Czech art-loving public. Travaillant avec des Polaroïds périmés, cette artiste les présente au mur comme des tableaux ou dans un diaporama; elle montre aussi de petits films sur des écrans minuscules. La diversité des formats fait que le spectateur, cherchant un fil conducteur narratif, s’éloigne et se rapproche, attrape ici une bribe d’histoire alors qu’il se laisse là capter par la pure beauté des images. On ne sait trop de quoi il est question, une histoire de gens qui s’aiment dans une caravane dans le désert mojave, une ambiance qui s’instaure peu à peu, des drames qui se nouent, une histoire d’amour entre deux héroïnes passionnelles, un cheval qui meurt aussi. S’en dégage l’étrange poésie d’un univers féminin, où l’homme semble un intrus à peine toléré. Les couleurs passées, les images partiellement oblitérées du fait de la dégradation de la pellicule, les effets de miroir traduisent visuellement la fragmentation de l’histoire, ses incertitudes oniriques et ses flous narratifs. C’est 29 Palms, CA, une exposition de Stefanie Schneider à la Galerie Morave à Brno, en République Tchèque, jusqu’au 14 juin. On ne voit ici, je crois, qu’une facette du projet, qui semble bien plus complexe, mais la manière dont les défauts de l’image et les accrocs du récit se répondent m’a bien plu. Photos 1 et 3 de l’auteur. Photo 2 Archives de la Galerie Morave, Brno. Stefanie Schneider étant représentée par l’ADAGP, les photos seront ôtées du blog à la fin de l’exposition. The project can be seen at the Berlinale / Forum in the Atrium of the Gossip Bar (Filmhaus Potsdamer Platz) and the gallery Spesshardt & Klein. For the first time the complexity of this grand art project, which positioned between film and fine arts, as well as a link or interface in between various media, will be exhibited. An essential part of this project is the artistic, conceptual and filmic collaboration between actors, musicians, photo artists, directors etc. 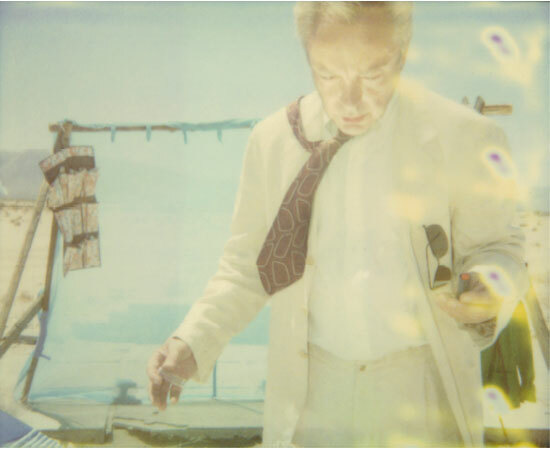 Udo kier is not only a performer, but also a producer. Marc Forster is responsible for directing the dialogues, and special effects in the post production. Radha Mitchell is writing the script. Sophie Huber, Max Sharam, Daisy McCrackin, JD Rudometkin, Zoe Bicat and Camille Waldorf are all writing the music, developing their characters and acting as performers. All participants are developing and acting out their characters. Steve Marshall is a performer as well as the DJ of the “Lonely Hearts Radio Show”. Sabine Dehnel will build the DJ booth of the radio station as a model, which will then be emulated as the DJ room for the film. The vision of a feature-length film is just as important in this as all the single, small stages or fragments, which are necessary for this film: Just as life and the circumstances of our social reality, the project 29 Palms, CA is in a state of constant change and development. The film is a biography and a social commentary, whose characters act as the alter egos of those individuals who portray them. In the course of the art project the different performers have contributed ideas, stories, scenes, monologues, poems, music and films, so that the basic principle of the concept, namely a collaboration of different perspectives and the pooling of different fragments and depictions, bestows a lively rhythm upon the film. Each character will introduce his or her character in the form of a fictional or semi-fictional diary on the website, which was specially developed for this project. The website hereby plays the role of an independent world from which the film project and the radio show emerge. The characters take influence on what will be seen in the film through their descriptions. Through the radio show connections between the individual performers will be established. 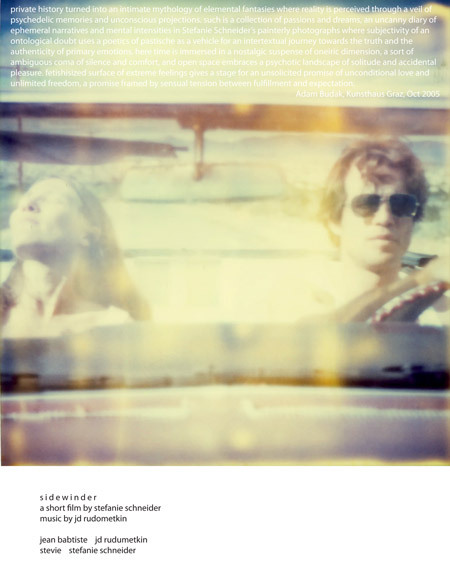 The whole film is generated from Polaroid pictures, which Stefanie Schneider is editing into the film. The fact that the films are expired leads to the surreal distortions and colorings. 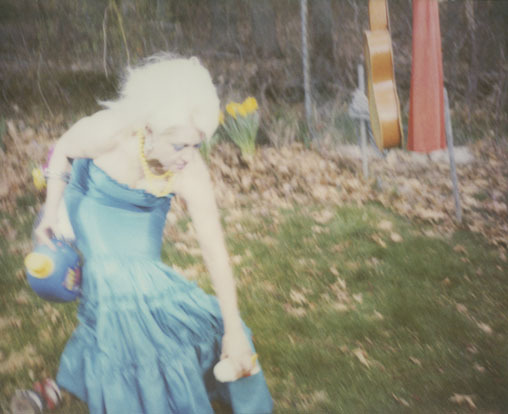 The pictures appear fleeting and taut, blurry. Stefanie Schneider paints with her Polaroid films. She clearly alludes to the ambivalence between imagination and portrayal, between fiction and reality, and leaves it to the viewer to form his/her own picture, to remain in a surreal or real space. The motive of the desert also supports the dichotomy between imagination and reality, at any moment breaking the clearness of a definite ascription, which is definitely not found in her work. All the more clear it becomes that the characters are living in their own lost world, but that life itself can change their perspective on their world. The place in which the performers of 29 Palms, CA are living, is more an idea or a reflection of a place than a place per definition itself. The light and the desert landscape are painting an imaginary reality, which the characters find themselves exposed to. Memories, fantasies and reality merge. 29 Palms, CA is a project positioned between film and art. In this project the German photo artist, Stefanie Schneider, explores and documents the dreams and fantasies of a group of people living in a trailer park community in the California desert. 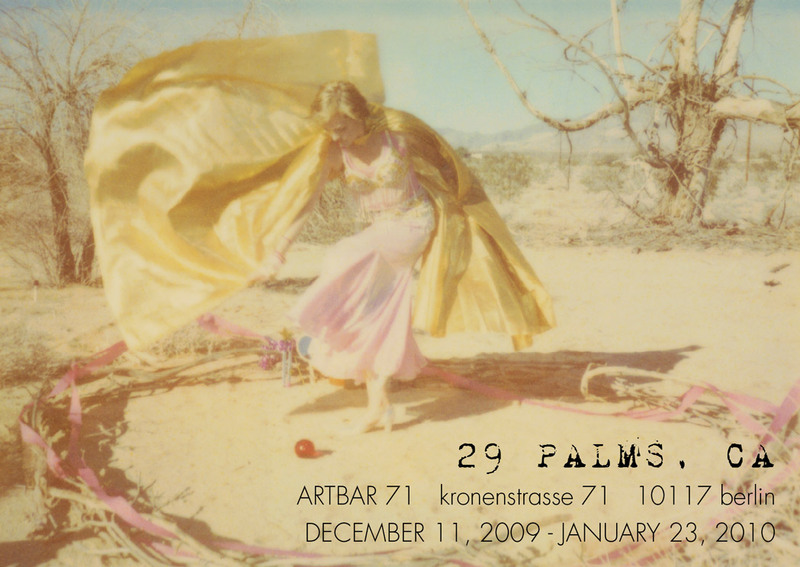 29 Palms, CA ist ein Projekt an der Schnittstelle zwischen Film und Kunst. Die deutsche Fotokünstlerin Stefanie Schneider erforscht und dokumentiert in diesem Projekt die Träume und Fantasien einer Gruppe von Menschen, die in einer Wohn- wagengemeinschaft in der Wüste Kaliforniens leben. Das Projekt ist zu sehen auf der Berlinale / Forum Expanded im Atrium der Gossip Bar (Filmhaus Potsdamer Platz) und in der Galerie Spesshardt & Klein. Erstmals wird die Differenziertheit dieses großartigen Kunstprojekts, was zwischen Film und Bildender Kunst sowie den Schnittstellen verschiedenster Medien agiert, ausgestellt. Ein wesentlicher Teil dieses Projektes ist die künstlerische, konzeptuelle und filmische Kollaboration zwischen SchauspielerInnen, MusikerInnen, FotokünstlerInnen, RegiesseurInnen, etc. Udo Kier ist so beispielsweise nicht nur Darsteller, sondern auch Produzent, Marc Forster ist verantwortlich für die Dialogregie und die Special Effects der Post Production, Radha Mitchell schreibt das Drehbuch, Sophie Huber, Max Sharam, Daisy McCrackin, JD Rudometkin, Zoë Bicat, Camille Waldorf schreiben die Musik, entwickeln ihre Charaktere und agieren als Darsteller. Ebenso wie Robert Mack, Renée Chabria, Soraya Wright, Cathy Lloyd Burns, Austen Tate, Scott Burns, Thom Bishops und Romina Djelosevic ihre Charaktere entwickeln und sie auch darstellen. Steve Marshall ist sowohl Darsteller als auch DJ der “Lonely Hearts Radio Show”. Sabine Dehnel ist Künstlerin und wird den DJ-Raum der Radio Station als Model bauen, der dann für den Film als Raum nachgebaut wird. Die Vision eines abendfüllenden Spielfilms ist dabei ebenso wichtig wie die einzelnen, kleinen Etappen oder Fragmente, die zu diesem Film nötig sind: Genau wie das Leben und die Lebensumstände unserer gesellschaftlichen Realität in einem Fluss ständiger Veränderung sind, ist auch das Projekt 29 Palms, CA einer fortlaufenden Veränderung und Entwicklung unterzogen. Der Film ist eine Biographie und eine soziale Reportage, deren Charaktere als alter egos jener Individualisten auftreten, die sie selber darstellen. Die unterschiedlichen DarstellerInnen haben im Laufe des Kunstprojekt Ideen, Geschichten, Szenen, Monologe, Gedichte, Musik und Filme beigefügt, so dass die Grundlage des Konzepts, eine Kollaboration von verschiedenen Perspektiven und das Zusammenbringen unterschiedlicher Fragmente und Darstellungen, dem Film einen lebendigen Rhythmus verleiht. Jeder Charakter wird seinen eigenen Charakter auf der Website, die eigens für dieses Projekt entstanden ist, in Form eines fiktionalen oder semifiktionalen Tagebuchs entwickeln. Die Website spielt dabei die Rolle einer eigenständigen Welt, von der aus das Filmprojekt und die Radio Show entstehen. Die Charaktere nehmen durch ihre Beschreibungen Einfluss auf das, was in dem Film zu sehen sein wird. Durch die Radio Show werden Verbindungen zwischen den einzelnen DarstellerInnen aufgenommen. Der gesamte Film entsteht aus animierten Polaroid Bildern, die Stefanie Schneider zu einem Film zusammenschneidet. Das Ablaufdatum der Filme ist der Grund für die surrealen Verzerrungen und Farbigkeiten. Die Bilder erscheinen flüchtig und gespannt, verschwommen. Stefanie Schneider malt mit ihren Polaroid-Filmen. Sie spielt eindeutig auf die Ambivalenz zwischen Vorstellung und Darstellung, zwischen Fiktion und Realität an und überlässt es dem Betrachter sich ein Bild zu machen, sich in einem surrealen oder realen Raum aufzuhalten. Denn auch das Motiv der Wüste unterstüzt diese Gegensätzlichkeit von Imagination und Realität, bricht in jedem Moment die Eindeutigkeit einer festen Zuschreibung, die ihren Arbeiten definitiv nicht zu entnehmen ist. Umso deutlicher wird, dass die Charaktere in ihrer eigenen verlorenen Welt leben, das Leben selber aber die Perspektive auf ihre Welt verändern kann. Der Ort, an dem die DarstellerInnen in 29 Palms, CA leben, ist mehr eine Idee oder eine Reflektion eines Ortes, als ein Ort per Definition selbst. Das Licht und die Wüstenlandschaft zeichnen eine imaginäre Realität, der sich die Charaktere ausgesetzt sehen - Erinnerung, Fantasie und Realität gehen ineinander über. Do you believe in love at first sight? We do, ever since we first saw Stefanie Schneider's pictures in a gallery in Hamburg a few years ago. Never before have we seen such an honest and apparently deep relationship between an artist and the medium which builds the center of our lives and thinking: Polaroid film. 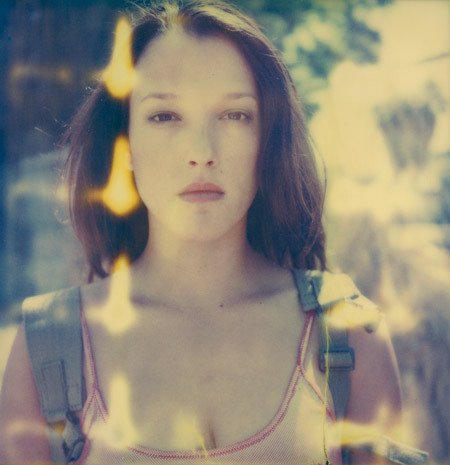 Stefanie loves to work with all kinds of expired Polaroid material and pushes the chemistry, its colors and our senses beyond its limits, telling stories of love and desire and developing a very own characteristic feel reaching into the spectator's soul. Some months later we had the chance to meet Steffi and found out that she does not only shoot Polaroid images, so intense that it blows our minds, but that all these Polaroids are part of an outstanding masterplan, the maybe biggest Polaroid art project ever: A film almost completely made out of Polaroid material mixed with short super 8 sequences. Called 29 Palms, this project is still work in progress. This progress from now on can be viewed online at the newely opened website www.twentyninepalms.ca. Here you will find out all its details such as exploring the characters and the film's concept. Immediately we started collecting expired material all over the planet to support her vision. 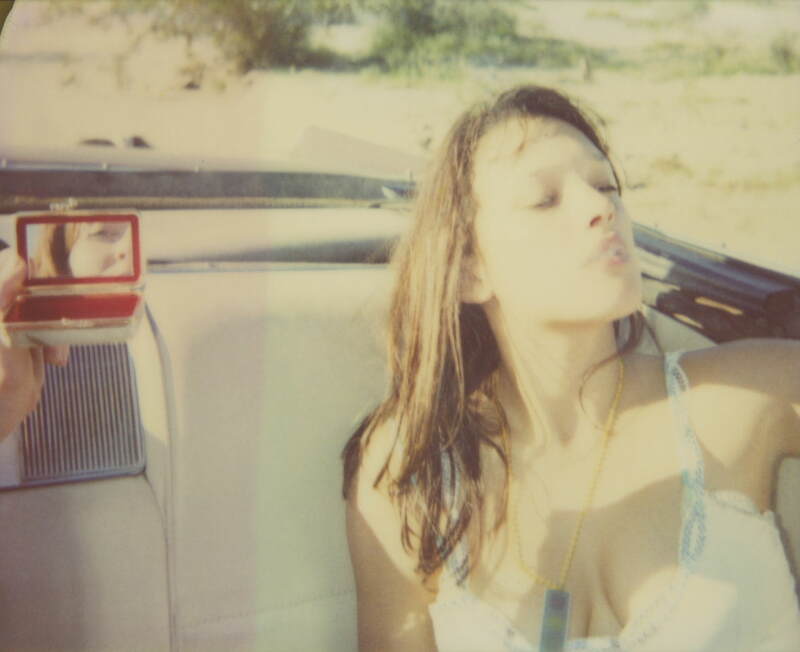 As a return, Stefanie Schneider now presents a very special and dedicated collection of limited ediion prints of so far unpublished and unseen pictures of her newest Polaroids shot recently this winter in the actual location called "29 Palms" in the United States of America. Parts of this newest work will be proudly presented by our POLANOIR project, to be seen and admired the first time live in the exclusive exhibition at the POLANOIR gallery in Vienna. FRIDAY the 21st of September. Please book your flights and hotels as soon as possible as this is something you should not miss for sure. 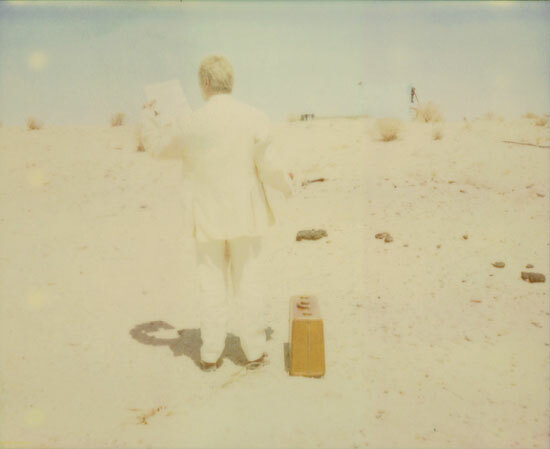 If you do not feel like waiting that long before diving into Steffi Schneider's picture-world and before investing and supporting her 29Palms project, please visit our ever growing Polaroid bookstore at unsaleable.com. 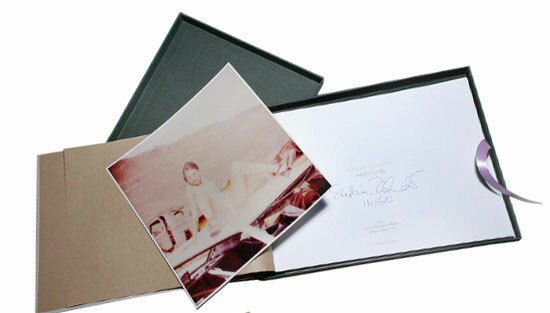 There you will find the two high quality books "Wastelands" and "Stranger than Paradise" , both hand signed by the artist as well as the very exclusive and strictly limited Special edition boxes (only 50) of these two books, including a handsigned Stefanie Schneider small format c-Print. Enjoy. © unsaleable.com // Newsletter by Lia Sáile. You received this email because you are subscribed to the unsaleable.com newsletter.